Here's a new game that I've been working on. It's nowhere near complete, but it is playable. 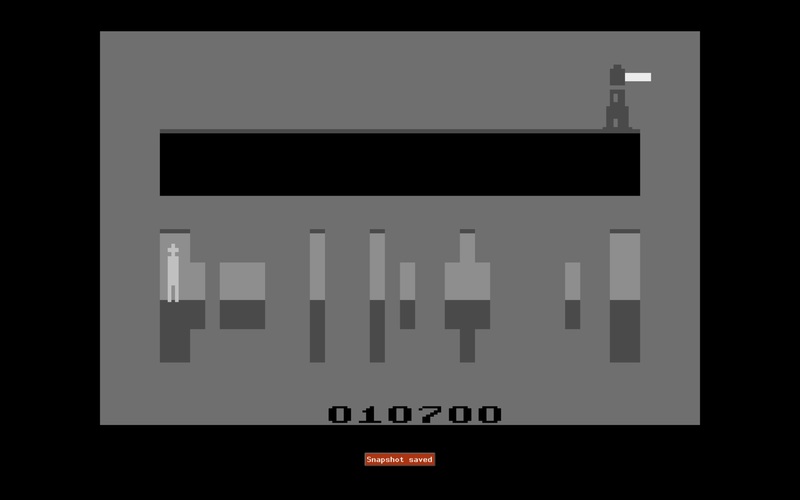 Don't try to adjust the "Color / B/W" switch on your 2600 - this is a "Noir" game. You are a spy in a trench coat and fedora trying to... well, I haven't quite worked out that part of the story yet. But there is a rotating lighthouse in the distance. If the beam falls upon you and you aren't completely hidden behind the wall, a sniper will end your life in a hail of bullets. Push the joystick left and right to walk in that direction. The fire button will make your player duck. This is helpful to hide behind shorter segments of the broken wall. Cross to the right side of the screen to score 100 points. The broken wall is randomly generated each time. 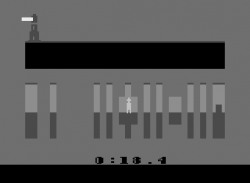 Once you pass a certain number of screens, the level will advance and the wall sections will become more sparse. You get 100 points for passing each screen, and 10,000 points for clearing each level. Right now, there is no limit to the number of lives you have. If you die, just push the fire button to try again from the left side of the screen. Limited lives are in the works. I'm also planning to set up the timer minikernel to add some pressure to the game. Note: if flashing screens bother you, this game flashes the background once every 3 seconds or so as the lighthouse beam passes over the player. IF YOU WANT TO TURN OFF THE FLASHING, SET THE RIGHT DIFFICULTY SWITCH TO POSITION "A". NEW 6/17/2015: The game is pretty much done at this point. I cleaned up a few last minute bugs, added reset switch functionality, and set up the left difficulty switch to turn on or off the guns at the sides of the screen. Edited by graywest, Wed Jun 17, 2015 4:12 PM. Played it for a minute, neat 3-d effect with the lighthouse! Got 400 points..
Wow really neat concept. Could use some creepy tune in the background to create tension, but other than that really neat once I figured it out. I did find a (maybe?) bug though. After I cleared 600 points and went to the next screen, it gave me 10,700 points. Very cool Graywest! I'm curious to see what you do with this game. Thanks! The score thing is not really a bug - you get 100 points for passing each screen, and 10,000 points for clearing each level. So congrats - you beat the first level! 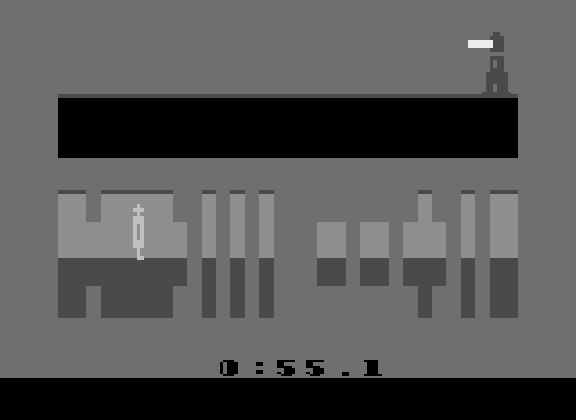 The levels get longer as the game progresses. Level 1 has seven screens, level two has... 15 screens maybe? There is some formula that controls it, I can't remember off the top of my head. 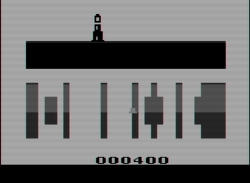 The lighthouse moves to the left as you pass each screen, when it gets all the way to the left, the level is over. Fun game! I like the steady filling out of each screen. The duck and cover move looks good and I think it's challenging. Very good animation. Here's a new version. The game runs on a timer now. For the first stage, you have one minute to pass seven screens. There is no limit to the number of times you can die and restart, as long as you make it to the end of the stage before time runs out. Each stage gets progressively longer, but you also get more time to clear them. I added the racing timer minikernel and modified it so that it counts down instead of up. 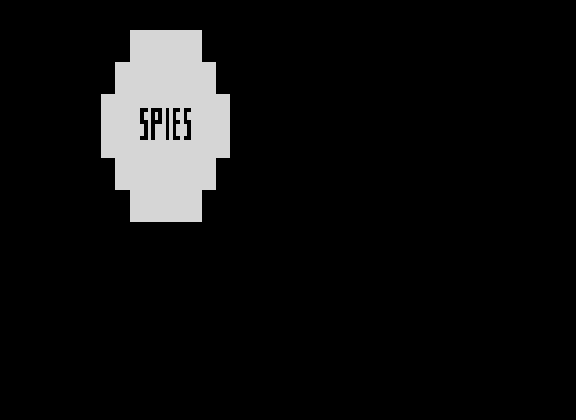 Also made a custom timer font, something that I think looks a little more "1940s". I'm adding lots of elements to see what works best. Future plans include: a detonator at the end of the stage that blows up the lighthouse, a gun that shoots at you from the right or left edges of the screen on higher stages, sound, level select, title screen, and more. I'm going to try to keep a score in addition to the racing timer, so I need to figure out how to display that. Edited by graywest, Wed Jun 3, 2015 11:55 PM. I've also created a title screen. Push the fire button to start a new game. Interesting idea. I'd love to see it colorized! Haha, sorry man, I apparently am too dumb to read. Great though! Glad to know I beat the level. Oh yeah! This is getting better and better! I really like the title screen and the gameplay is excellent. This one should be a cart! Cool game idea. I would have never guessed that's what the random bit patterns you asked about were for. Since only the taller sections of walls can protect you it makes me wish I was able to duck when pressing down. Also, since it's a sniper shooting at you, it might be more appropriate to have a single head shot instead of a blanket of bullets. To make it more pronounced you could add blood to that animation. Might be neat to have just that one use of color. Thanks ZackAttack! Your random bit pattern demo programs gave me some good ideas. You can duck behind the shorter wall sections too, you just have to push the fire button rather than pull down. I have other plans for the "down" direction on the joystick that I'll add at some point. I like your idea about the headshot and one color. It may be tricky to add at this point, though - since I have no_blank_lines turned on, I lose a missile and I can't use multicolored player0. But we'll see. Here's the latest. I added all of the sound effects tonight, which makes it seem much more like a real game now. I still want to put in a song, but that will come later. I also added a score feature. The score isn't displayed onscreen during the game since the timer is in use, but after the game ends your final score is shown on the title screen. Scoring is still the same: 100 points for each screen completed, and 10000 points for destroying the lighthouse at the end of each level. I love this game....works great with stella. I'd love to play on real hardware but don't have a Harmony cart. Did you make a label for your cart? I'd love to see some vintage & cool artwork for this one (like Atari did back in the day on the labels and boxes)! I call it a "cart" but it's really just a circuit board with a socket and EPROM in it - I don't have a shell yet because I'm just testing. 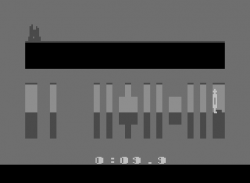 I wish I were talented enough to make something like the Atari artwork from back in the day! I'll make a label at some point, but it will probably be something simple. I'll make a label at some point, but it will probably be something simple. 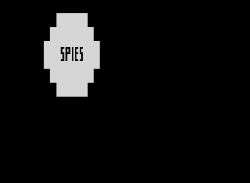 Three major additions: I added a spy-themed song to the title screen. I also added an option to turn off the background flash if that sort of thing bothers you. Just flip the right difficulty switch to "B" to turn off the flash, or flip it to "A" to turn the flash on. 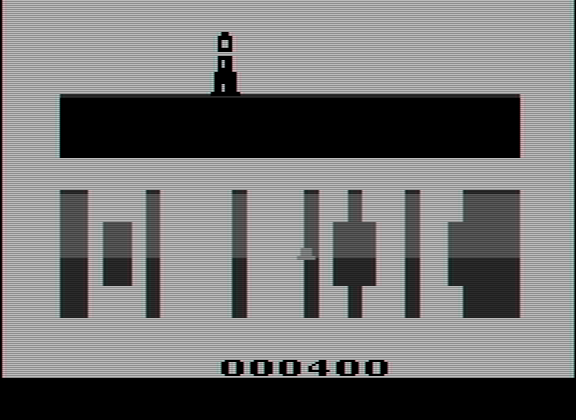 Finally, I fixed a game-breaking problem that happened on the higher levels (around level 4 or 5) - when the difficulty ramps up, the game would sometimes create such a large gap in the wall that it wasn't physically possible for the player to cross it between lighthouse rotations. That problem should be fixed now. Nope, I don't think I changed anything, difficulty-wise. You must be getting better! HOWEVER... getting too easy for you? Try this version! Tonight, in addition to fixing some minor display and audio bugs, I also added a new challenge. 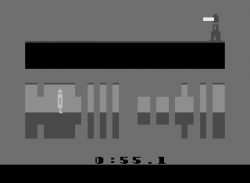 At random intervals, a gun will appear on either the left or right side of the screen and take shots at you. You will need to duck under these bullets in addition to hiding from the lighthouse beam. Getting hit by a bullet won't end your game, but it will send you back to the left side of the screen. The guns won't appear until you complete level one. Also, on level four, the bullets speed up. Good luck! P.S. I also switched the difficulty switch settings for the "flashing" toggle. On right difficulty "A", the flashing is turned off. Set right difficulty to "B" to turn the flashing on. Edited by graywest, Sun Jun 14, 2015 11:07 PM. Yeah harder.....much harder.....couldn't past level 2. But I like the gun idea! I can't think of anything else that I want to do to this game, so I'm thinking it's pretty much complete. This update adds reset switch functionality - press reset during the game to return to the title screen. I have other plans for the "down" direction on the joystick that I'll add at some point. What was the "down" direction going to do?